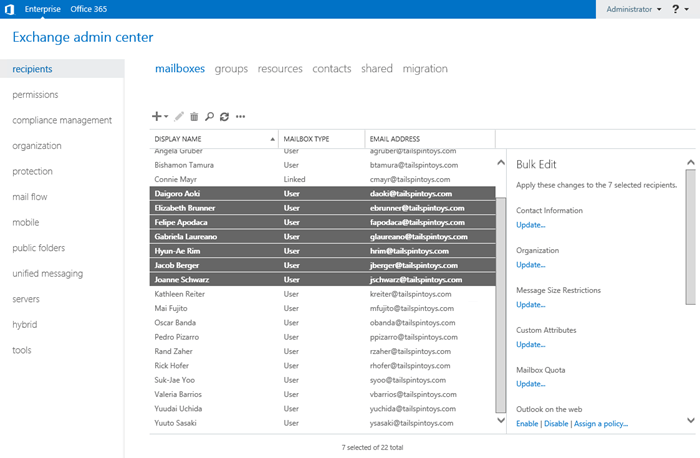 In Exchange Online, you can use the Exchange admin center (EAC) or Exchange Online PowerShell to assign permissions to a mailbox or group so that other users can access the mailbox (the Full Access permission), or send email messages that appear to come from the mailbox or group (the Send As or Send on Behalf permissions). The users that are assigned these permissions on other mailboxes or groups are called delegates. Note: Although you might be able use Exchange Online PowerShell to assign some or all of these permissions to other delegate types on other kinds of recipient objects, this topic focuses on the delegate and recipient object types that produce useful results. If you assign the Full Access permission to a mailbox that's hidden from address lists, the delegate won't be able to open the mailbox. By default, discovery mailboxes are hidden from address lists. • Use the Add-MailboxPermission cmdlet in Exchange Online PowerShell to assign the Full Access permission with the -AutoMapping $false setting. For more information, see the Use Exchange Online PowerShell to assign the Full Access permission to mailboxes section in this topic. To open and use the EAC, see Exchange admin center in Exchange Online. To connect to Exchange Online PowerShell, see Connect to Exchange Online PowerShell. When a mailbox is added to Outlook using Advanced Settings, only the primary mailbox will be added; the archive mailbox won't be added. If a user needs to also access the archive mailbox, the mailbox should be added to Outlook as a second account in the same Outlook profile. In the EAC, go to Recipients > Groups. Replace <MailboxIdentity> with the identity of the mailbox and run the following command in Exchange Online PowerShell to verify that the delegate is or isn't listed.. This example assigns the Send As permission to the Printer Support group on the shared mailbox named Contoso Printer Support. This example removes the Send As permission for the user Karen Toh on the mailbox for Yan Li. Replace <MailboxIdentity> and <DelegateIdentity> with the name, alias, or email address of the mailbox or group and run the following command in Exchange Online PowerShell to verify that the delegate is or isn't listed. Replace <MailboxIdentity> or <GroupIdentity> with the identity of the mailbox or group and run the one of the following commands in Exchange Online PowerShell to verify that the delegate is or isn't listed.